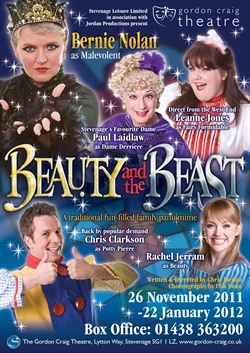 Last weekend I went to see the pantomime Beauty and the Beast at the Gordon Craig Theatre in Stevenage. A riot of Baldwins attended to in order celebrate two December birthdays in the family. Of our group of ten, four of our number were children and three of them young girls who love princesses and fairy tales. The performance was a sell out and in my opinion was in fact the best pantomime I have ever seen and is therefore worthy of a review. The cast which didn’t include any well known TV or film stars did however include Bernie Nolan, one of the famous Nolan sisters. Bernie played the bad ‘Malevolent’ and was therefore subject to many boos and hisses (or in my daughter’s cause boos and pisses; a mistake on her part but one which was hilarious for us and those around us within earshot – she was rapidly corrected by Mrs. Baldwin). At one point in the panto Bernie Nolan led the cast in a rendition of ‘I’m in the mood for dancing’ which was just terrific. Great to hear the late seventies classic getting an airing – and where else could you go to hear the song performed by a genuine Nolan? The singing didn’t end there either; we were all treated to some classic Abba too – quite amusing to hear Abba tunes sung by a Nolan sister – Bernie was a good sport! The singing meant that the show was not just a pantomime but a musical too! Two other cast members that added real value were Potty Pierre and Dame Derriere (played by Chris Clarkson and Paul Laidlaw – Gordon Craig regulars). The traditional panto mother and son team were great fun and had the children laughing out loud. One particular skit saw the pair performing a real tongue twisting feat about the spotty potty of Potty Pierre. Another scene (this time in the kitchen) saw some significant plate smashing which would have made the Greeks proud. With the addition of pyrotechnics, an excellent aerial dancing moment between Beauty and Beast (aided by cables) and the kids completely engaged, dancing in the aisles and having so much fun, I have to report that the pantomime was a real success. The show runs until 22 January so if you want to go, and I recommend it, you might want to book your ticket/s quickly.